I just wish to express and share some of my concerns. Below a bullet list with here and there a link to an example case. I really love this site. It scares me a bit when you say something as dramatic as this. I agree, it would be great if it was more vibrant and had more experts, but the sites been ticking away for over six years now and doing good stuff. By site traffic (https://stackexchange.com/sites?view=list#traffic) we're doing better than about 30% of other stack exchange sites. 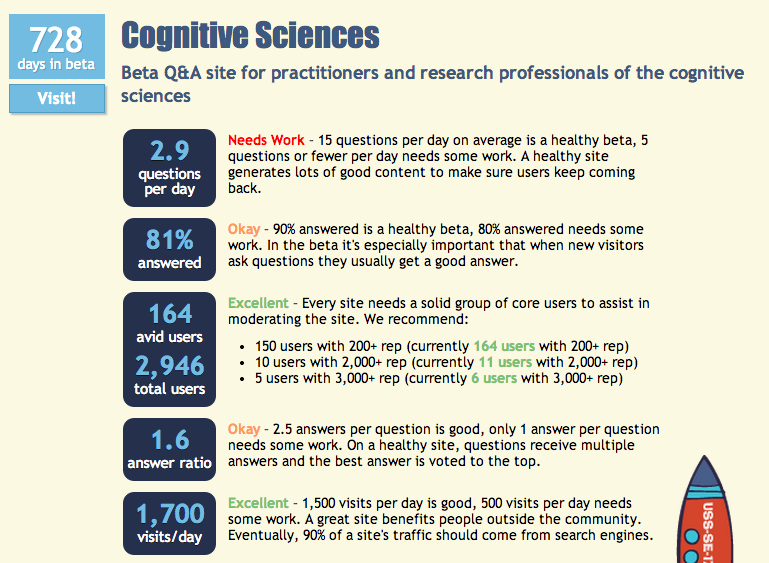 At the time of writing, there are eight graduated sites with less daily visitors than Psychology (3.9k, 6y3m). For example: Software Recommendations (3.8k, 4y2m); Emacs (3k, 3y7m); Theoretical Computer Science (1.5k, 7y8m). 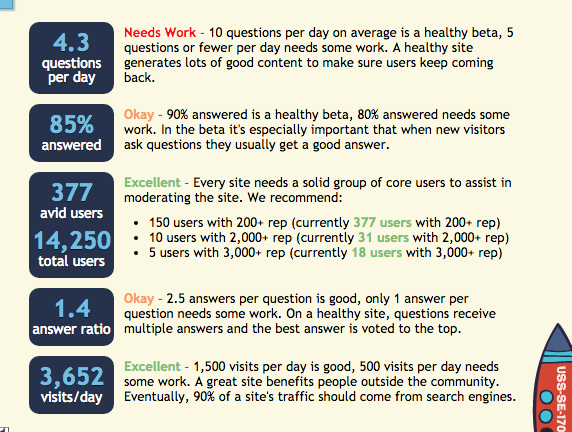 By the metrics that we are judged on at area51 (q per day, % answered, users and visits per day; with the exception of answer ratio), the site has improved over the last few years (see below). See in particular, the early days where we were low on traffic, questions per day and so on. If I were to guess, I wonder whether we are getting a few more questions since the name change, but I'm not sure. 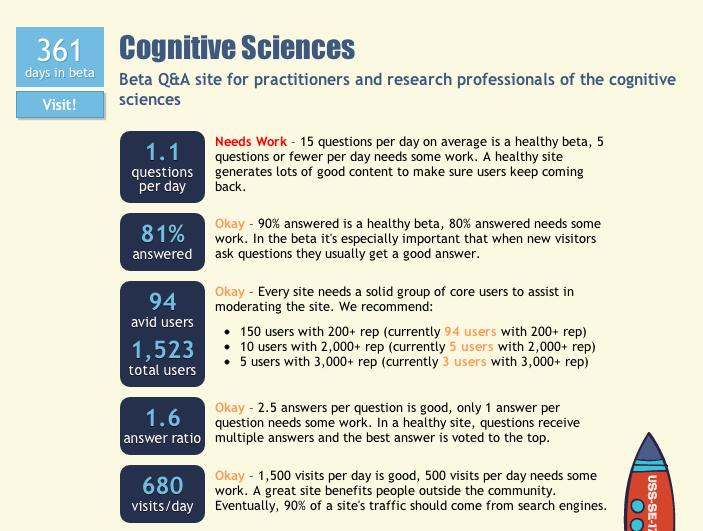 There's a lot of great content on the site and it represents an important space in the stackexchange world (i.e., psychological and neuro- science). I think more generally, this site has never been a superstar in the stackexchange world, but we've been ticking away and doing good stuff for many years. And to be clear 3,600 visitors per day represents 1.3 million visits per year (i.e., something like 1.3 million people per year hopefully being helped by the answers they find on this site); I think that's pretty cool. I think what I take from this is that you've been doing an amazing job and perhaps carrying too much of the modding weight. I need to do (and will do) a bit more modding work. I've been on the mod team since the beginning (early 2012). I've been a bit more immersed in writing papers and building an academic career this last while. But this is a good reminder to get a bit more involved in the site again. And perhaps think about opportunities to promote the site to other academics and other forums. It'd be great to get a few more experts actively involved. Perhaps we also need to think about getting one more mod involved? With the other two mods jumping back in (and possibly others gearing up a bit) I can already feel a big difference in site dynamics, especially the number of votes being cast. Given that unaccepted answers with less than two votes do not make it into the site statistics this is already a huge leap forward. However, this observation confirms that we are small and that a few hi-rep users can make a lot of difference (Of course many kudos to the other, sometimes super-long time hi-rep users that have been, and hopefully will remain, active). Given the high impact I notice of just a few hi-rep users, we may consider to request another pro tem mod to replace Artem. On the other hand we risk that this site's dynamics are dominated by the mods' actions, but I would vote pro.